Below is a travelogue from my drive across Route 66 in October, 2009. Change of plans. Instead of shooting north to take the Oregon Trail, I’ve decided to stay on Route 66 all the way to Los Angeles. It’s just too much fun! After leaving St. Louis, I spent a two full days doing nothing but driving The Mother Road and taking in all its attractions, signs, cafes and decaying buildings in Missouri and Kansas. Along the way I stayed at another classic Route 66 motel where I got eaten up by bedbugs, saw the world’s largest rocking chair and the world’s largest gift store, toured an amazing cavern with one of the world’s biggest stalagmites and visited a town that could easily be taken right out of Back to the Future. Here are a collection of highlights from driving across Route 66 in Missouri and Kansas. The Sinclair Service Station in Gay Parita, Missouri, has been turned into a museum of Route 66 paraphernalia. One of the classic Route 66 motels, still run by the same woman who ran it 30 years ago. The motel features one of the most famous neon signs still lit up today. Long before it was a tourist trap, Jesse James and his gang used these caves to escape from the long arm of the law. Since 1933, it has invited millions of guests in to tour the amazing stalactites and stalagmites. Since it’s low season, my tour consisted of three total people plus the guide. An entire store filled with beautiful wood carvings all done by chainsaw. The owner’s late husband was one of the pioneers of the art form and she spent nearly an hour chatting with me about the history of chainsaw art. A huge museum filled with antique toys. Unfortunately, although the owner was all too willing to invite me into his gift store and chat for 30 minutes about toys and Route 66, he would not open the actual museum as he was expecting a special guest. No comment. One of the originals of this mid-west fast food franchise, my guidebook stated that there would be carhops serving me my meal in my car. In reality, it was just a guy who brought a menu to your car, took your order and brought you a bag of food. I did not stay. This attraction was only built a few years ago, but it fits right into the Route 66 landscape. The name says it all. Literally, it had rows and rows of gifts, all organized by type such as Coca-Cola, dolls, Route 66 stuff, signs, lanterns, etc. A beautiful old stone building in the middle of a town square filled with storefronts that look like they are still in the 1950s. This area reminded me of Back to the Future. 1.21 jiggawats! A recreated old-school gas station. 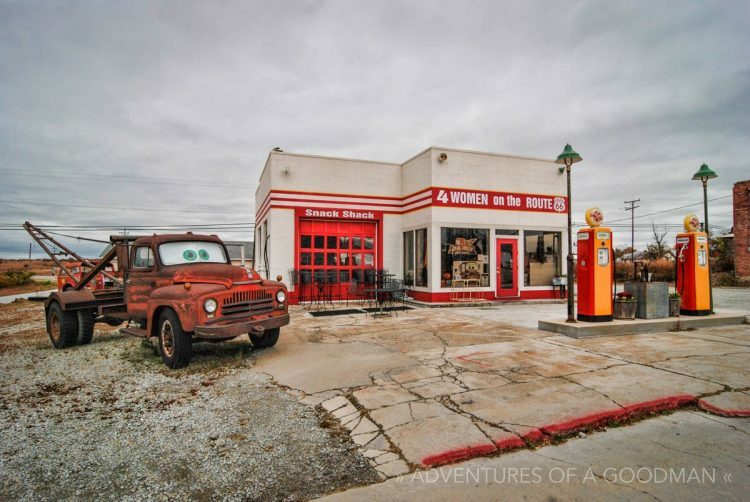 A restored service station run by four women that has one of the inspirations for the Pixar movie Cars outside. The only remaining single-span concrete bridge on Route 66. Great architecture and surroundings. This stretch of road and bridge used to be one of the most dangerous parts of Route 66. Now it’s just one of the most scenic: filled with rough original road and draped with trees.